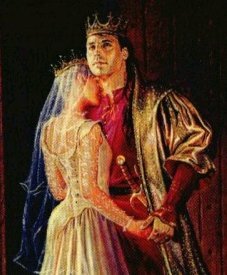 Copyright ©1999 Katherine Kurtz The prologue, chapter 1 and chapter 2 of King Kelson's Bride are available for you to read on the Deryni Destinations site. You can also view images of the dust jacket, including the front cover, the spine and the two inside flaps on the prologue page. A Division of Penguin Putnam Inc.
KKB is due to be released in America on the Monday the 12th of June 2000 by Ace Books. You can visit the publishers site for their review through this link to Penguin Putnam, then click on newsletters, click on Sci-Fi/Fantasy Ace, and the KKB review is in the Future Shocks section. A review of KKB has been written by Steven H Silver and is available for you to read at www.sfsite.com/~silverag/kelson.html. You can pre-order KKB from amazon.com or from amazon.co.uk. Chapter 1 of KKB was uploaded to the deryni destinations site on Saint Valentine's day. News at the end of 1999. It seems that the story of KKB ties up a lot of the loose ends at the end of TQfC. Firstly, that Kelson is finally going to marry. Secondly, that Liam should be placed on his Torenthy throne before Morag, his mother, and Duke Mahael, his uncle, remove him in favour of his younger brother. All of this means that Kelson has to make a journey to Torenthi. The prologue reveals some of the plot for KKB. It seems that neither the Camberian Council or the Torenthi regents have any idea about who Kelson will marry. But they both assume that he must marry soon. The reasoning of the Torenthi regents is that Kelson must father an heir before Liam can marry and father his own heir, so that the next Haldane heir has the advantage of being older when dealing with the next Torenthi heir. I think that the regents are assuming the the next Torenthi king would naturally take advantage of a weak Haldane to attack Gwynedd. There are some more new characters including a new Camberian Council member by the name of Sir Sion Benet. The descendents of Richard Haldane are introduced and hopefully the family of the Hort of Orsal as well. Both families have daughters involved in the rumours of possible marriges. There are several other people who marry, or may be planning to marry, by the end of the book. Jatham and Janniver marry in the first chapter and the prologue explains that Princess Richelle Louise Haldane, daughter of Duke Richard Haldane, is to marry Brecon Ramsey, the latest possible heir to Meara. 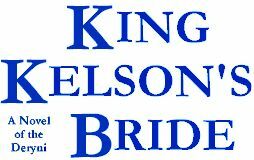 Go here to learn who Kelson marries and to find out more information about who is marrying who, with some family histories. Some of the basic plot information that has been revealed is that there will be an assasination attempt to kill someone. There is one funeral in the story for an old and very well respected Deryni person. I think that this is for one of the members of the Camberian Council. It seems from the hints that have been given that Jehanna is to finally accept that she is Deryni and maybe she even remarries. At conventions in 1999, KK has provided more background information about Jehanna when answering questions about the relationship between Brion and Jehanna. After Jehanna went into retreat at St. Giles's Abbey when she discovered that Brion had Deryni powers, she was forcebly brought back to Rhemuth by Brion and seems to have gone through a very unhappy period. All of this is to be told in the Childe Morgan trilogy. KK already has the basic story of these books, but has to finish a couple of other books before they can be written. News at the end of 1998. The events in the latest book to be written by KK start in June 1128, about IV years after the end of "The Quest for Saint Camber". There are three weddings in KKB. One of these is Kelson and his bride and the second, taking place in the first chapter of the book, is that of Jatham and Janniver. For detailed information about KKB, collected at readings given by KK of the prologue and chapter one, you should look at the Convention Reports for 1998. Before the identity of the bride was revealed, a couple of potential brides for Kelson were nominated. As well as revealing Kelson's bride, KK also annouced that Dhugal remains unmarried at the end of KKB. So I have adapted the bride nomination form to allow you to suggest some more brides for Dhugal. It also seems fairly certain that a large portion of the book will be set in Torenth a few years after the end of QSC. This is logical as the biggest political, unfunished issue for Kelson was to settle the Torenthi threat. Hopefully, this might involve placing Liam on his thone without him being killed by his uncle. Rumours have surfaced that both Derry and Arilan will receive parts in KKB and various matters may be settled. Will Arilan reveal to the rest of the Bishops that he is deryni? KK finished KKB in June of 1998 and it has since been referred for at least one revision. The hardback version of the book is due to be published in the summer of 2000 by Ace Books. Robert Reginald, co-author of the Codex, has informed the newsgroup that the release of the updated paper-back version of the Codex will delayed until after KKB. Let us all wish and pray (and send peeps) that KK and the publishers can release the book soon.